When wearing SCBA, it can be very difficult to communicate through the facepiece and more so through the radio. 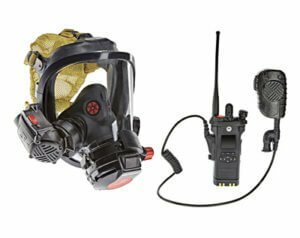 All SCBA manufacturers have built into their facepieces a way to communicate with either speaking diaphragms or an amplification device. Sometimes these devices make the communication clearer and sometimes they produce more feedback. One way to increase the quality of your communications is to hold the radio mic directly to the facepiece lens. By making this contact, the radio mic will pick up the voice much clearer than by holding it two inches away from the speaking diaphragm.